Our Spring Heath, Erica carnea, 'Pink Spangles,' came into full bloom on April Fool's Day this year in my wife's rock garden. This low-growing evergreen shrub will continue to bloom for another month in its full-sun to part-shade location. Many people think heath and heather will not grow as far north as Albany, NY, but here is proof it does well as long as it has acidic and very well-drained soil. A south-facing rock garden is the perfect site. We bought this gem at Rock Spray Nursery on Cape Cod a couple years ago and it took this long to settle in and get growing. 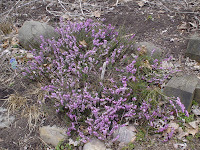 We also bought several plants of heather, Callunia vulgaris, from Rock Spray and I will post their photos to my blog as they come into bloom over the season. You can buy heath and heather at many different places, but, I would encourgae you to go to Truro this summer and ask David and Alissa to put together a collection that is right for you. 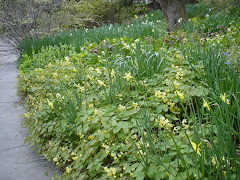 For more information on these wonderful plants, visit the UConn Plant Datebase.